Children are messy. Their work is messy. Their handwriting is messy. Their thinking is messy. But their enthusiasm, their joyfulness, their energy is wonderful, and so I am ok with a little messiness if it is produced in a rush of eager creativity. 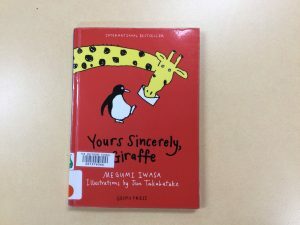 For instance, I have been reading Yours Sincerely, Giraffe by Megumi Iwasa to one of my Y3 classes, and we finished it this morning. It is utterly charming, and worlds away from anything else we have read recently – the simple language and imaginative story remind me a bit of The Little Prince by Antoine de Saint-Exupery, while being totally different in setting and characters! 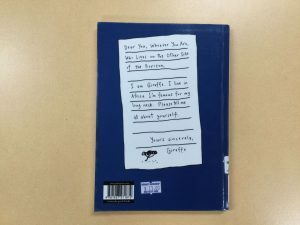 Anyway, we finished reading it this morning, and everyone enjoyed it, so when I discovered that my other planned activity wouldn’t work I threw in something else I’d been thinking about – writing letters like Giraffe and Penguin! 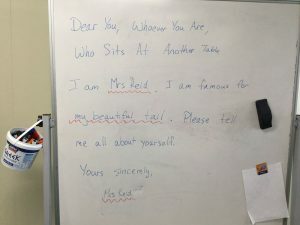 I wrote an example on the board, and invited everyone to write a simple letter, using their own name and giving a clue as to what animal (currently proven to be living on the Earth, so no dinosaurs, Bigfoot or dragons) they were. Letters were hastily written, folded up in a variety of ways, then randomly distributed around the room, to be opened upon the count of three. The most fun part happened next, as students read out the clues and made their guesses, some perfectly accurate and others hilariously off the mark. 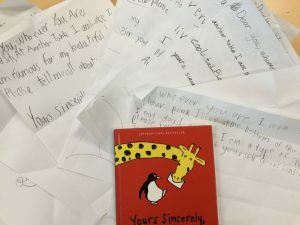 We ran out of time to read out every single letter, but the boys had so much fun, and so loved the little puzzle and the connection to the book, that I have to say it was one of the best things I’ve done with them this year. 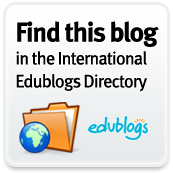 I have just read an interesting blog post by Laura Fleming which argues that if the library isn’t being used, just changing the space won’t make a difference. She says you should bring about a revolution in the culture of the library before trying to renovate. Laura is very emphatic on the importance of student input when considering changing space organisation, furnishings, technology and of course choosing resources. It is refreshing to see something which does not rely upon spending $$$ on the latest new furniture in the hopes that the ‘shiny’ will be attractive enough to bring in more users. Things which might be a hard sell in my school? Food in the library, or games in the senior library. I believe that the school executive would like to improve the academic tone of the senior school, including in the library (statements at the start of the year about the library as a quiet study space), so I might not get a lot of support for radically changing that. Academic Integrity Wheel of Awesome! Trying to bring a bit of pizazz into referencing lessons is hard, but I’m giving it a shot! Not much there is “traditional” literacy, but all are so important now!